Gloria Bohan founded Omega World Travel in 1972 as a storefront travel agency in a small town. Today, that company is one of the top woman-owned businesses in the US. Very much a hands-on owner, Gloria manages the day-to-day operations including strategic partnerships, e-commerce execution, and the long-term direction of the organization. 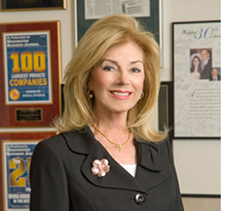 Gloria's many business accolades include enshrinement into the Enterprising Women "Hall of Fame," Tour and Travel News' "One of the 25 Most Influential Leaders in the Travel Industry," the American Society of Travel Agents "Travel Agent of the Year" and Office Depot's "Businesswoman of the Year." Gloria is a graduate of Marymount Manhattan College, where she also serves as a trustee and holds an honorary doctorate.